The Weather binding collects current and forecast weather data from different providers with a free weather API. It can also be used to display weather data with highly customizable html layouts and icons. The table below shows the apikey properties for the different weather providers; at least one must be specified. Hamweather is the only provider with multiple keys; both are required. Each location has a <locationId> that can be referenced from an item. Multiple locations can be specified by repeating these properties with different values for <locationId>. Important: Each weather provider has a daily request limit for the free weather API. Since the weather does not change quickly, please choose a moderate updateInterval. The request limit can be found on the weather provider website. 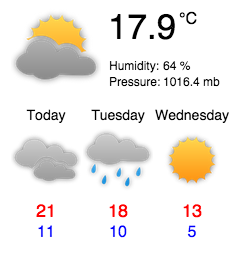 Let's display the current temperature and humidity in Salzburg (AT). The apikeys below are not registered and are for example purposes only. Each item can be formatted with the parameters roundingMode and scale. Supported roundingModes and what they do can be found in the JavaDocs . Default values are roundingMode=half_up and scale=2. Some, but not all, providers (eg. ForecastIO) allow passing a units parameter in method calls in order to specify which units (metric (SI) or imperial (US)) should be used by returned data. If you copy and paste, don't forget to change the locationId to the one you specified. The accuracy depends on your location and which weather provider you choose. Some providers update the data in realtime, others only periodically. The common id property (locationId=..., type=condition, property=commonId) is an attempt to have a unique weather id for all providers. This is useful for displaying weather icons and a short condition text message. The documentation from the different weather providers are partially poor, hence the mapping is partially a guess and needs to be optimized. To see the current mapping, open the file common-id-mappings.xml in the binding jar. The weather-data folder is the root, the images folder contains the different iconsets with 32 weather icons. 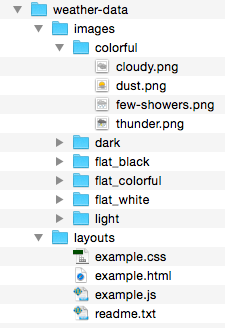 In the layouts folder are the layout html files. You can add as many html layout files as you want. You can use tokens to map weather data into the html layout. If you have a great looking html weather layout you want it to share, just send it to me and I will put it on this wiki page. If you don't see these entries, check your items file. important note if you're installing from a debian based distribution: openhab-addon-action-weather and openhab-addon-binding-weather are not compatible with each other and will silently fail (at least since 1.7.1). If you made sure your openhab.cfg and your items are fine but you still don't see any ProviderConfig lines you might want to check the installed openhab addons.